The Swivel Stool With Back White is a modern and minimalist design that can be utilised for a number of purposes. 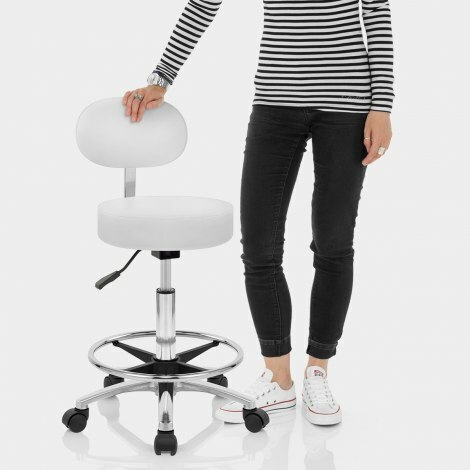 Whether used in the home, workplace, or business, the Swivel Stool With Back is a fantastic all-round item that you are certain to love. The padded seat offers ample comfort whilst the backrest provides effective support. 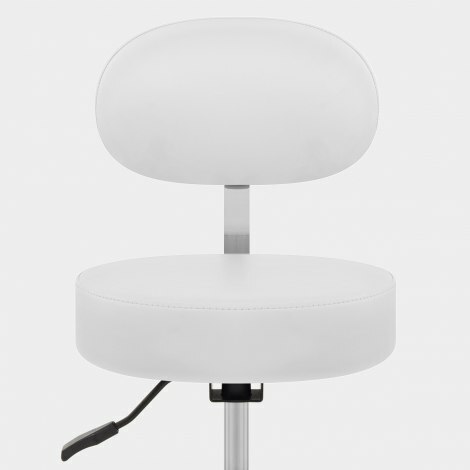 Covered in contemporary white faux leather, the seat is supported by a chrome frame. The sleek chrome stem enables manual height adjustment and 360-degree swivel thanks to a gas lift mechanism within. A variable height circular chrome footrest makes a practical perch for the feet, with satin black connector pieces making for a striking contrast. Nylon castor wheels at the end of each of the feet permit smooth mobility across the floor, making the Swivel With Back a truly must-have item.